I don’t have an actual exact fabada recipe that I follow. I have basically cobbled together bits and pieces from the way different people in my family (my mom, my dad, my uncle…you get the picture) make fabada, coupled with what I personally enjoy in it. I’ve never posted it before because I didn’t really have a recipe to share. But people have asked and so I’ve decided to share the story of my fabada, if not the recipe, here with you. 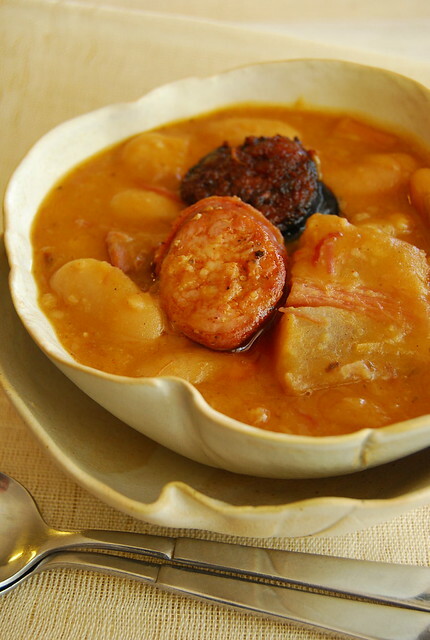 There are people who would argue what exactly makes a traditional fabada…that is not an argument I want any part of. I make it my way because that is the way I like it. I like my fabada thick and hearty, deeply flavored and packed with both beans and meat. The kind of meal you would give a hungry sailor after he had been out to sea for a month. Others prefer it soupier and lighter…if you are one of those people, this fabada may not be for you. So…if you are from the hungry sailor school…let’s get started! What I am going to give you is my basic method, a framework, the range of ingredients I use, what I do to them, and why. You can then play around as you heart desires! Obviously. Some people prefer small white beans, some prefer the jumbo specimens, but I really like how the medium ones turn out, so that is what I use. Strangely enough, my favorite so far are these ones. I say strange because they are not Spanish. If you’d like something a little more authentic you can go to Terry’s Selection and knock yourself out. They have both little white beans and the huge ones that seem to be so popular with everyone else but me. I’m sticking to my favorites (which you can find in Santis Delicatessen). I’m more of a happy medium person myself anyway. Whatever you choose, use dried and make this from scratch. I am not averse to shortcuts (in fact I have published a “cheat’s” version of fabada in Yummy magazine many moons ago), but this is the long slow road to bliss version. I use two kinds: bilbao (which I think is only referred to as “bilbao” in the Philippines) or any deeply flavored, dark red Spanish cooking chorizo, and morcilla (Spanish blood sausage). For the chorizo bilbao/cooking chorizo: I like to use something fairly fresh (i.e. not from a can) but strong, because it will need to share all its flavor with the resulting stew. Usually the wrinkly looking dark ones are good – but you want to make sure they are cooking chorizo, NOT the type that you slice and eat for drinks and nibbles. If I see some that say “viejo” I’ll usually get one to just make the stock good and strong. I like to get the house-made chorizo bilbao from Alba’s restaurant or the chorizo from Terry’s Selection. For the morcilla: I get this from Terry’s, nowhere else. This is, no pun intended, the back bone of this dish. It is what gives it depth of flavor and body and, not to wax religious or anything, a soul. If you can get the bone of a jamon Serrano then you are in luck. This is the best and will impart awesome flavor to your fabada that will push it further than you ever thought it could go. I sometimes find some in Alba’s but you have to seriously stalk them for it. You may be able to get from Terry’s as well – I haven’t tried but it’s on the to-do list. If your family buys legs of jamon and you get to keep the bone, let’s be friends. Worth the wait and the effort however way you get it. If you can’t manage a jamon Serrano bone don’t despair. I have used other, more readily available ham bones with great results (Majestic and Excelente). Another lovely option is to use a ham hock…a small bone-in ham (from the hock, which is the ankle or thereabouts). Then you have both the flavor and the ham meat. If you are using just the bone you can buy jamon Serrano bits from Terry’s or, failing that, can use any other ham bits. I use slab bacon, not the sliced ones you have for breakfast – I like seeing hefty chunk in my stew. I get this from Santis (where they will slice from a big slab to your specifications) or from most supermarkets (in Rustans they have what they call “picnic bacon” which comes in a small slab which will do as well). I have also tried it with Tyrolean bacon (from Santis). More recently I used guanciale which I had around and it was fantastic. I use onion, garlic, black pepper, bay leaf, and dried oregano. This is what my mom uses and so I do to. They impart a familiar waft of scent that forever ties fabada to my childhood…which is one of the other reasons I love it so. Also, from my dad, pimenton de La Vera. Get the type that has a Denominación de Origen – those are the only ones that really taste of smoky Spanish fantasies. Just trust me on that. Sometimes, if I want to give it a kick, I add 1 or 2 (or 3) long green finger chilis (siling pang-sigang). No salt – with this much cured meat you will hardly ever need to add salt. I actually have two, and each takes two days. Don’t panic! The reason it takes two days is precisely because I like to avoid panic. I chop up the work so you never feel too overwhelmed with effort. Before you get started: Soak the beans…if you want. Yes, I don’t really have a strong opinion here. I’ve forgotten this step many times. The will just need to cook for longer. It has never resulted in disaster. Put the ham bone in a big pot with a couple of onions (peeled and cut in half), some garlic (peeled and left whole), a bay leaf, and some black pepper. Cover with water by a good 2 inches. Bring to a boil and lower to a simmer. Skim away any scum and simmer for about 3 hours (or more!) until stock is fragrant and tasty. You want it to have reduced and be full of flavor. When done, pick the ham bits off the bone (or the meat if you used a ham hock) and set aside. Strain stock and set aside. Place a large pot over medium high heat and add some olive oil. Sauté some chopped garlic (about 5 cloves) and onions (one large) until the onion starts to soften. Add the dried oregano (my mom used to make a small cup in the palm of her hand and use that to measure), a bay leaf, and some ground pepper. You can also add the chili now if you are using. When the onions are soft add the chorizo bilbao (I use around 3 pieces, sliced fairly thickly…I like chunks!). Sauté until the chorizo starts rendering some of its orange oil then add the bacon slab (I use around 400-500 grams, cut into hefty chunks). Sauté just to seal the bacon pieces, then add ham bits/meat and beans (I use 2 400-gram packs of the beans I mentioned above). Add a good couple of teaspoons full of pimenton and then stir to coat everything. Add the stock so the liquid is more or less 1 to 3 inches over your ingredients (this all depends how soupy you want it…you can always add more stock later). Bring to boil then lower heat to a slow simmer. An hour or so into the cooking time, add a whole peeled onion and a whole unpeeled head of garlic. After another hour add the morcilla (about 2 pieces, thickly sliced). Stir gently as the morcilla is very soft and you don’t want it to be totally disintegrated. Cook until the beans are soft, stirring occasionally to make sure nothing is sticking or scorching. Taste throughout to see if it needs more seasoning or if you need to add more stock. In a big pot place the beans, the ham bone or ham hock, chorizo bilbao (whole), bacon slab (whole), one or two whole onions (peeled), a whole head of garlic (unpeeled), two bay leaves, some black pepper corns, dried oregano, and the chili if using. Cover with water by a good 2-3 inches. Bring to a boil then lower to a simmer. Skim off any scum. Let this cook long and slow until everything is soft and yielding. Stir occasionally just to make sure everything is going as planned and nothing is sticking. This will take hours but you can get a ton of things done while waiting. Remove the meats as they cook and soften, and set aside. The chorizo is usually done first, followed by the bacon. You want to wait until they are nice and tender. If you are using a ham hock it will usually be done the last (before the beans). If you are using a ham bone just keep it in until the beans are soft. You want (or more to the point, I want) the beans to be soft and creamy, without turning into mush, although some may and that’s ok because it will thicken the stew. Test about 4-5 beans to make sure they are done. When the beans are soft, turn off the heat. Tuck all your cooked meats, and the beans when cooled, separately, into your fridge for a nice rest. Take your meats and beans out. Cut the chorizo and bacon slab into nice hearty chunks. If your ham bits are already smallish do not chop further. If you’ve used a whole ham hock then shred the meat with a fork, again, quite chunkily. Slice the morcilla thickly. Get some new bacon and chop into lardons. Chop an onion and some garlic. Place a pot on medium high heat and, when hot, add a couple of generous swirls of olive oil. Add the morcilla slices to the hot oil and pan-fry on each side until just cooked. This will take a couple of minutes max, if that. You don’t want to overdo it. Remove the morcilla from the pan and set aside (I like to add the morcilla to the fabada last so that it doesn’t disintegrate). At this point you can, and I sometimes do, fry new chorizo bilbao, likewise thickly sliced, and then set aside to also add later. This way you have some freshly cooked chorizo along with the chorizo you boiled yesterday. Why not? You only live once. Now you have a decision to make. Take a look at all the orange-tinted oil in the pan. That glorious, chorizo-scented oil. Do you want all of that in your fabada? Or do you want to be prudent and remove some of it? The choice is yours friend. Do what your heart tells you is right. Nobody is watching. Ok, now add the onions and garlic to the morcilla/chorizo-stained oil (however much or little you left). Sauté until the onions soften. Add all your chopped meats and a good couple of teaspoons full of pimenton and toss to coat everything. Things are going to look angry-orange and crazy-wonderful. At this point, if you have any lying around, you can deglaze the pot with some glugs of wine, scraping all the wonderful bits from the bottom of the pan. Now add your beans and mix gently, trying not to crush the beans but not making too big a deal if some take a hit. Add some freshly cracked black pepper and the morcilla (and extra chorizo if you decided to add some). Mix (gently!) and taste. Does it need salt? Most of the time, it doesn’t so do not try to salt this dish at any point aside from the very end (and I’ve never had to). I also sometimes add more pimenton or black pepper if I feel it’s lacking in the smoky department. If the fabada seems to be too dry for your tastes just add some water and adjust the seasoning accordingly. You are done!! You now (hopefully) have a good, homey, comforting, cure-all-ills, stick-to-your-ribs fabada that can feed hungry sailors. You can make this a day before because it benefits from “sitting” for a bit. My dirty secret: I love fabada on day 5, when it has started to, um, age like a good vintage 😉 But that’s only for experienced bean eaters. You can have this with a good hunk of crusty bread, or, as we are more inclined to do in these parts, with a good mound of steaming rice and a drizzle of olive oil and vinegar. Despite this painfully lengthy post, or maybe as evidenced by it, the most important ingredients in fabada are love and patience. Tend it well, don’t rush it, and it will repay you in spades. Like I said, there are many ways to cook fabada. This is mine. Remember, fabada, and all eating, at least to me, is about pleasure. And no one can tell you how you should experience pleasure – only you. So my wish is that you make this your own. Have fun and happy cooking! That looks and sounds ever so good! A comforting and scrumptious dish. I had only looked at the blog post title without scrolling down, and I thought "wow, she really means business with this one…" Every cured pork and bean dish that I'm familiar with IS a labour of love! The hubby loves the giant white lima beans because the skins are thinner and, well – he likes the nutty butteriness of them. The thing that sets apart fabada from other similar recipes is the pimenton. I can't get enough of that stuff!! In the Spanish style, this needs a dry fruity cider to wash it down. Mmmmmm. Hi Midge! Sounds yummy! In my family alone each person has their own way of making it so I imagine there are indeed a million ways to make this! Hi Ling! I love labour of love dishes!! 🙂 I love pimenton too, I use it way too often I think, haha! Oh my this reminds me of home back in the day when my mom used to make this.I'm going to try and make it, following your instructions. Thanks for sharing and wish you and your family a great Easter, J ! That stew looks so comforting! I'm definitely on the hungry sailor school side. The ingredients alone are music to my ear: bacon, ham, chorizo, herbs.